Highland Suite, Queen bed, full size sleeper sofa, private full bath. 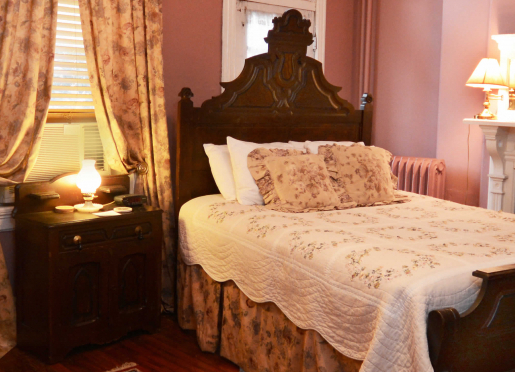 A family friendly Victorian bed and breakfast in the nation's capital is sure to quickly become your home away from home. 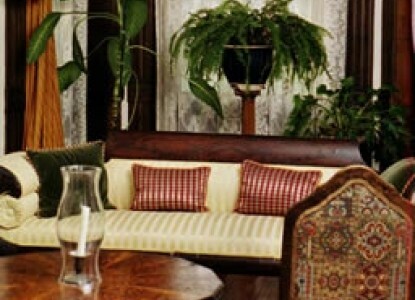 The Chester A. Arthur House Bed and Breakfast of Washington D.C. is full of the personal touches that make a guest feel at home precisely because it is also home to the innkeepers who have dedicated the bed and breakfast to Chester A. Arthur, on the United States' "forgotten presidents." There are four oversized guestrooms available, each with complimentary Wi-Fi and cable television. 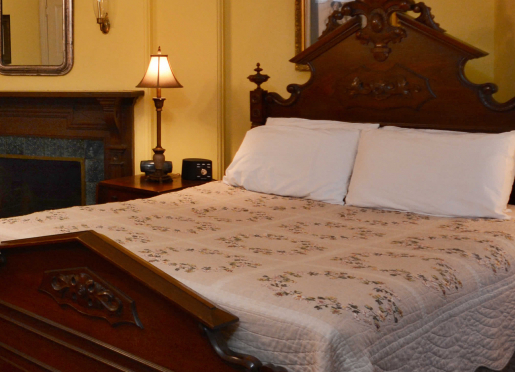 The General Logan Room, located on the second floor and overlooking Logan Circle itself, offers a Queen size bed and a Twin size pop up trundle bed, allowing for up to three guests. The General Logan Room also offers a full private bath. 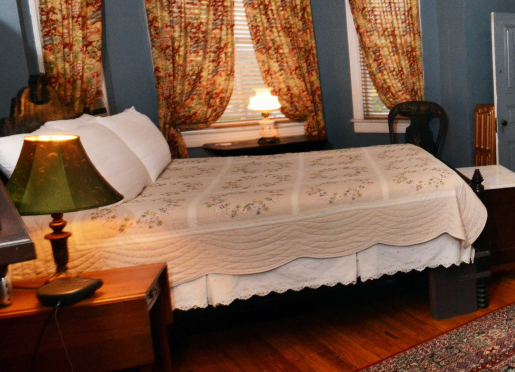 The Magnolia Room, also on the second floor, has a view of the 20-year-old Magnolia tree from the garden/deck area behind the house and is furnished with a Queen size bed and private full bath. 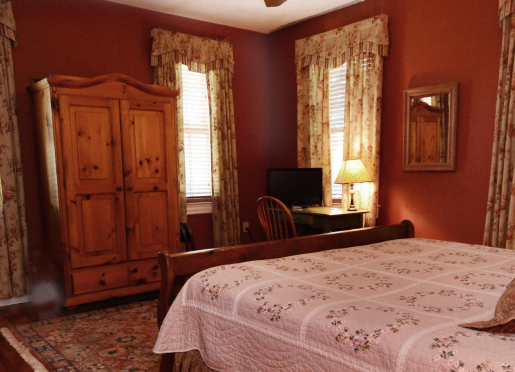 The Cinnamon Room, located on the second floor, is furnished with a King size bed and private shower only bath. The Highland Suite, located on the third floor, includes an overstuffed sofa that opens into a double bed and a small, attached kitchenette. Mornings begin with a family style, hot cooked breakfast served at 8:00 a.m. daily. Starbucks coffee, select teas and freshly squeezed orange juice are also available. However, for guests that must leave before breakfast is served, there is a choice of cereals, yogurt, and seasonal fruit. Capitol Hill, the Convention Center and several museums are within walking distance of the house. The nearby metro stop will quickly and conveniently take you to any other points of interest that you might wish to visit such as the Eastern Market (D.C.'s food and arts market), National Mall, Garfield Park and the Library of Congress. Welcome to Chester A. Arthur Bed and Breakfast! 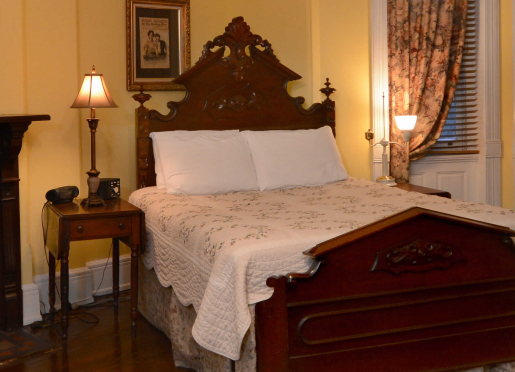 Make your stay in Washington, DC memorable by choosing the Victorian charm of our private home, the Chester A. Arthur Bed and Breakfast. Tour the Smithsonian Museums, National Monuments, White House, National Zoo, Arlington National Cemetery, and countless private art galleries and museums, all within easy reach using Metro, bus or walking. Business travelers will find many of Washington's convention locations easily accessible along with desks in each room, complimentary WiFi and televisions with cable. The Washington Convention Center is just a 15-minute walk, or the Ronald Reagan Trade Center, 10-15 minutes by bus. 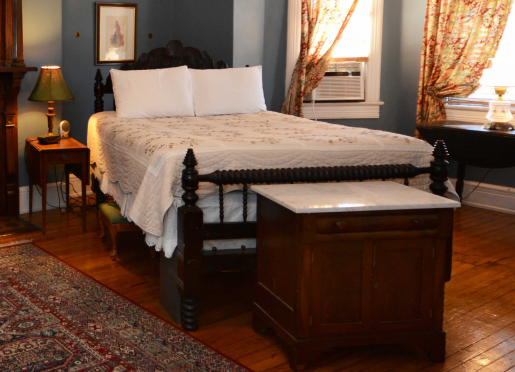 The Chester A. Arthur House is a true Bed & Breakfast, part of a genteel tradition born in post WWI England. Visitors are guests in our home. Our building was originally owned by Henry C. Richardson, a wealthy undersecretary of the Treasury during the administration of Chester A. Arthur, one of the nation's forgotten presidents. It is to Arthur's political courage and good deeds, such as creating the modern civil service, that we have dedicated the house. The building was designed by B.B. Bradford, one of the important local architects, responsible for the creation of the look of Logan Circle, listed on the National Register of Historic places since 1972. The eclecticism of Victorian design is expressed by the mixture of styles: the rounded arch of Romanesque Revival at the entry doors and windows above; three-storied polygonal bay with articulated 6/1 window mullions; Queen Anne details of string courses; asymmetrical placement of entry door and fanciful checkered brickwork between pilasters surrounded by a pediment with intricate detailing to enhance the elevated entrance. Our home is furnished with furniture representative of the history of the house in both Romanesque Revival and Eastlake designs. Plaster mirrors, gilded pier mirrors and carved mantels with mirrors add light and reflect the furnishings throughout. The seating, upholstery and accessories in the main and second parlors represent Victorian colors and sensibilities and are combined with our collections from our careers and travels. This is completely compatible with the Victorian penchant for collecting as an art, and a thirst for travel and adventure by those who have lived in this house. Most details from the original construction of the home remain or have been reproduced including massive pocket doors with original brass, mechanical call buttons and speaker tubes for communicating with servants. Chandeliers were handmade by master craftsmen, who also furnished similar fixtures for the U.S. Capitol. Some features are no longer used including the cooking fireplace, original kitchen and servants quarters located in the basement. Travelers are always looking for memorable and relaxing experiences. Let’s discover more through the words of our innkeepers. Many thanks to Steven Lucas for sharing his own secrets with BBOnline.com! We have found that our guests come for one of two reasons, business or pleasure. Some are here to vacation and see the sites of the nation's capital, while others are here on business or for government work. 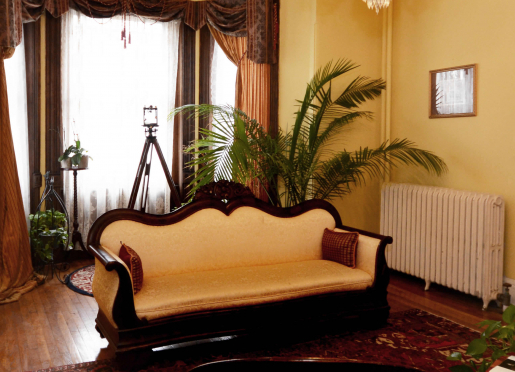 Guests who visit us remember our Victorian architecture and décor. Travelers who have never been to Washington D.C. should be sure to check out the Smithsonian and private museums, the city's many monuments, The White House, US Capitol, and the Library of Congress. 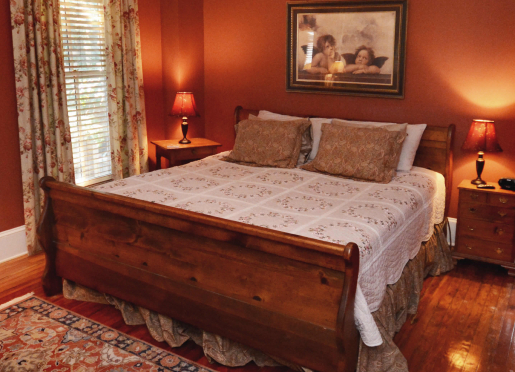 We love compliments, but our favorite has to be when someone says we offer great home hospitality and comfort. Visitors are often surprised by how walkable Washington D.C. is, and how much there is to do. For travelers staying more than just a weekend we suggest they take in the sights and visit some of the 15 Smithsonian Museums, 15+ monuments/memorials, and 13+ private museums. From our property, visitors can easily walk to the Convention Center, White House, numerous museums and the Metro. We have heard great reviews about all the restaurants within walking distance of the B&B, there must be 50 of them. We are world travelers, sharing a love of our old home, sailing the waters of the Chesapeake bay on Esmeralda, our vintage 1969, 34 foot Tartan Sloop. We also share a passion for writing, keeping us close friends with our computers. We are both long time residents of Washington DC. We love living in our Nations Capitol, welcoming travelers and sharing our knowledge of our neighborhood and the city. I am the former editor of the Alexandria Gazette, the same paper President George Washington read daily. I was also a member of the USA Today newspaper staff when it was launched in 1982. Currently, my work includes volunteering for the Butterfly Conservatory of the Mid Atlantic, specifically the Baltimore Checkerspot Restoration project, and writer and speaker for National Geographic, Natural History division. My husband Don has a host of professional interests and hobbies that keep him busier than he is aware. A talented photographer, and published author, his works include On High: The Adventures of Legendary Mountaineer, co-authored with Bradford Washburn, biography/autobiography of Washburn, as well as countless writings for National Geographic Magazine. His past work includes co-producer of Radio Expeditions with National Geographic and NPR's Morning Edition, White house correspondent for Congressional Quarterly and producer of Congressional Quarterly's weekly Public Television program Congressional Outlook. Visit Don's personal web sites for more about his work and hobbies. All visitors are treated as guests to our home. We offer a hot cooked breakfast, served family style, each morning at 8:00 a.m. weekdays and 9:00 a.m. weekends. We offer premium Starbucks brand coffee, select teas, and fresh squeezed orange juice. Guests on the go, who need to start their day earlier than our breakfast times, always have a choice of cereals, yogurt and seasonal fruit. We welcome well-behaved children of all ages. Some of our guest rooms have extra beds and we can provide a portable pack and play for infants. For those travelers with a car, we have limited parking available by advanced reservation for $20 per night. Our home is pet free and because of allergies, we are not able to accommodate guest pets. Smoking at our home is only allowed outside, either on the rear deck, or front entry. All children welcome. Portable crib available by request.